Having issues with your transponder key? Let Key Man Service Santa Clarita handle it. We have worked for nearly a decade providing exclusive automotive locksmith services to our clients, including Transponder Key Service. Transponder keys contain an electronic microchip built into the head of the key, which gives them their more well-known nickname ‘chip keys’. At Key Man Service, we provide comprehensive transponder key services to our clients in Santa Clarita and the surrounding areas. We also have technicians who specialize in replacing chips in various transponder key makes including Toyota, GMC and Ford. Here are some questions you may have about the service that we can answer in greater detail. A Built-in Alarm System- If a thief tries to access the car without the right transponder key, the alarm will sound and it could scare the attacker away. A transponder signal is unique to the car it unlocks, so it cannot be used to unlock other cars. Thirdly, cars without transponder key technology are more vulnerable to getting hotwired (usually older automobiles). 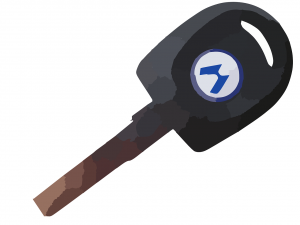 There are many ways to get a copy of your automotive key, especially your transponder key. You could cut the key at a local kiosk at any supermarket, but the quality may not be as good as a hand-cut key. Or you could go to a locksmith who could come to your location and cut the key in minutes. Nevertheless, Locksmiths use the same equipment as car dealerships and can get the same cut done at a fraction of what dealers charge. If you lose your transponder key, however, making entirely new copies will be a bit more expensive. Having issues with your old transponder key? Contact Key Man Service at (661) 210-1182 and get affordable transponder key service. Call us today!